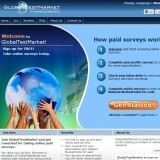 “Global Test Market”, found at globaltestmarket.com, is a leading market research company that was founded in 1999 and appears to be one of the better “get paid to take surveys companies”. Many review sites say they are in anywhere from 60 to 200 countries, but on Global Test Market’s own site they say they currently have members in 49 countries. No matter what the real number is, it at least affords people outside of the U.S., Canada, and the UK an opportunity to make some money by signing up for paid surveys. And even though no survey company pays a large amount of money to their online members (unless you are an unlikely winner of a sweepstake drawing), “Global Test Market” not only appears to pay more than most, you also are more likely to get a higher volume of survey possibilities sent to you. Well more than the “norm” of around one a week most reputable firms tell you to expect. Plus, even if you don’t qualify or aren’t accepted for an individual survey, Global Test Market at least gives you a little something for your trouble. As with all reputable survey companies, Global Test Market is free to join. For completing surveys and referring others to sign up you are rewarded with MarketPoints. You need to reach 1,000 points (which converts to $50) in order to receive a check. That does not equate with very much money for so much of your efforts. So basically with each point being worth 5 cents, you can expect to make between 25 cents to $2.50 for each survey. It is suggested each survey averages about 20 minutes to complete. Many Global Test Market members seem happy, and claim they often get several surveys a week… and of those surveys it seems they qualify to complete more than with other companies. You also get credited 20 points for each person you refer who also signs up to join Global Test Market… which is one dollar. That’s way too little for such a time consuming task. Granted, one dollar isn’t much for referring a friend – but honestly it’s more than with most survey companies except for Survey Club: http://www.FreeSurveyJunkie.com. There are, of course, many people who have been with “Global Test Market” who complain they didn’t get many surveys, were timed out or not accepted, or it took too long to get paid; but honestly those concerns are voiced with almost every> survey/research company. Global Test Market stands out at least a little in that a higher than usual number of their members also have good things to say about them. It’s easy to find things to be unhappy about with survey companies in general, as really none of them pay very much money, and you won’t qualify for even a third of the surveys they send to your email inbox. However, if taking surveys is something you find interesting, you could do much worse than ‘Global Test Market’. In an industry where you can’t really make much money in the first place, Global Test Market is at least a decently reputable company and would be one of your better choices to at least get a very little something in return for your time! Global test market is a scam, you do their surveys for months and when you do get enough to redeem for a check, their checks bounce!!!! I had ten checks from them bounce and have incurred $120 in bank fees now too. No one has a current phone number for them and they don’t respond to e-mails. RUN !!!!!!!!!!! Yes! Finally someone writes about Test Bank Marketing.